Two years ago on a science fiction blog I was running, I wrote a post entitled Future Idea: Computer Settings That Follow You, and today, I feel vindicated as a screenshot from the next version of Windows showed up, and it includes the essence of my idea in it. 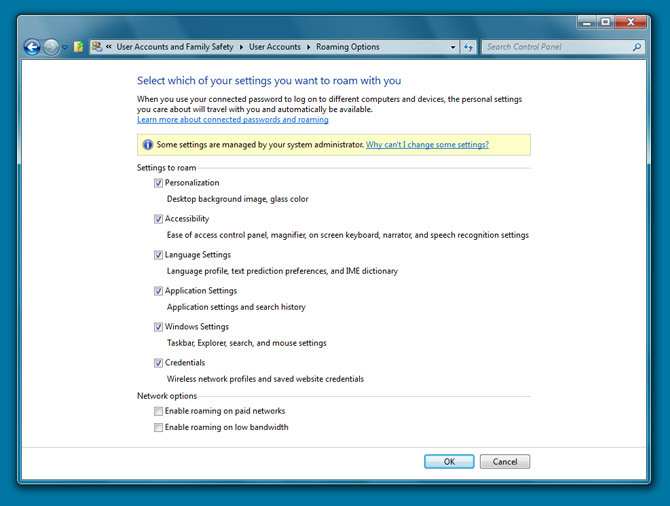 The next version of Windows will support roaming application settings. While many people talk about an Internet based operating system, I think the first step should be an Internet based user authentication system that pulls the basic “display and organization” settings from the Internet. Microsoft could implement something like this fairly easily. The advantage being that you would always have the desktop you know and love, on nearly any computer connected to the Internet. Also, if you were using storage space on the web, and had it mapped as a drive, it would be there waiting for you. Lastly, while it might not be feasible to have all your applications follow you around, it should be easy enough to correctly implement the settings you use on certain applications that are installed on the computer you are using. The feature, which appears to be only available for “Linked” Windows accounts (presumably to Windows Live), allows for users to “roam” to different computers and devices (*cough* Windows Phone) with their various settings and configurations, automagically applied. The range of settings for roaming include the desktop wallpaper, Aero glass color, accessibility options, language options, applications settings (probably only for AppX packaged apps), Windows settings and WiFi profiles and Windows-managed passwords. I am so excited to see how this turns out, and I definitely think it is the first step towards a usable Internet based operating system. I also won’t be surprised if Apple gets this to market first, so if you are looking at buying stock soon, and are wondering if you should throw money at Microsoft or Apple with regards to an innovation like this, I’d bet on Apple right now.